On February 3, the 116 meter long, 3340 dwt cargo vessel Amur 2516 was struck by ice in the Azov Sea between Dolzhanskaya and Yeysk, Russia. The Amur 2516 was headed to Ambarli, Turkey loaded with a cargo of peas when it struck an ice flow. The ice cut into the vessel’s hull and the cargo vessel suffered water ingress. The pumps on board were unable to keep up with the flooding and the vessel was at risk of foundering. 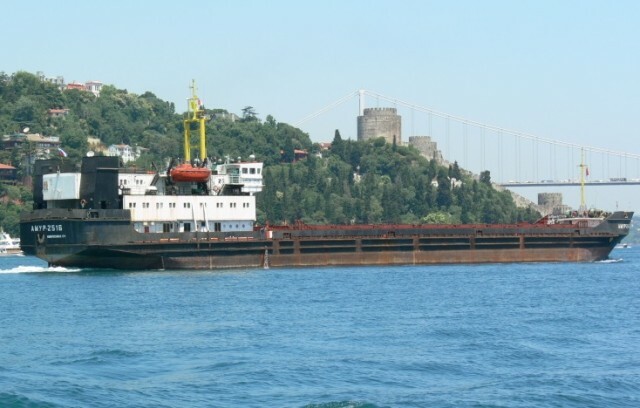 The master of the Amur 2516 turn course and intentionally ran the vessel aground in shallow waters and sandy bottom near Dolzhanskaya. No reports of injuries or pollution released. Reports state the vessel remains aground waiting until repairs can be made on the hull. Local authorities have launched an investigation into the incident.